Read the how and why about this list from the top of the #10 post, then come back to read about Kuhn Rikon Safety Lidlifter can openers. 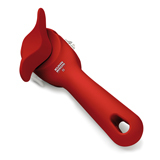 Kuhn Rikon Auto Sidewinder Safety Lidlifter & Auto Safety Lidlifter – Here’s a twofer for you. Both of these outstanding side-cutting can openers are the best at what they do. No other company I know offers such exquisite precision in their lid lifting mechanism AND a choice of ergonomic designs to suit any hand’s grip and ease-of-use concerns. Note also the large and rounded edges of the generous sized handle, another ergonomic benefit. Why a side cutting, lid lifting design in the first place? 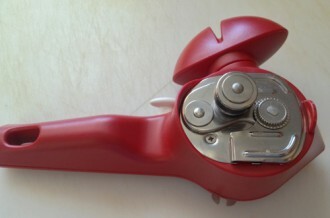 Conventional can openers cut the can from the top, resulting in jagged edges. Not only are the jagged edges a safety concern, but also, in typical use, the top of the can may fall back into the can, into liquid, and cause a messy splash and spill. Retrieval of the jagged top may require a tool to get it out of the liquid below if the user doesn’t want to use fingers. The top of the can is also a concern for sanitary reasons, which, if it drops into the liquid of the can’s contents, can be a health concern or at the very least, have a “yuck” and messy factor. Side cutting, lid lifting can openers cut the lid neatly below the can’s rim, with NO sharp edges. The entire top is then lifted off the can without mess and without the jagged edges. If desired, the top fits nicely back onto the can for temporary storage in the fridge. However, replacing of the top in this way does not provide a liquid seal nor should it be used as a long-term storage solution. 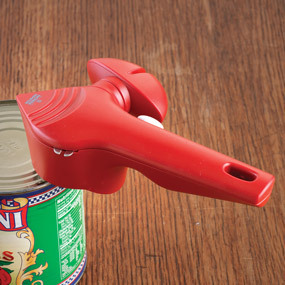 As with any manual can opener, there may be a consideration as to where the actuating grip or knob for the rotating cutter wheel is placed. Is it most comfortably on the top, with the hand overhead or is it most comfortable to use when located on the side, a position that for many users is not only more comfortable but also a function of greater mobility? I favor the side, but everyone has a choice. I know, as you read this, you are holding a hand in both positions, noting which is easier on the wrist. This is something you probably never have done before because you never knew about options. Note, too, the parrot-like side jaws and the white button on the opposite side. These “jaws” may be used to “bite” the lid rim after cutting for easier removal. The button closes the jaws while they grab the lid for removal. Releasing the button automatically springs open the jaws to release the lid, another useful design element. Regardless of which style is best suited to the user, Kuhn Rikon, and only Kuhn Rikon, the Swiss company that delivers a range of top tier kitchenware and prep tools, takes such care to provide these choices. Not only are these two styles available, the company also offers variations, with a “knobby” grip and a smaller size product. Explore at the first link below. For those with a conventional countertop electric can opener, switch to one of these for neatness, accuracy and to regain some counter space. Except for using soap and water to clean the business parts of a Lidlifter, there is nothing else to do, nothing to maintain. You can’t say that for the messy mechanisms of a conventional manual or electric can opener. See the Auto Sidewinder Safety Lidlifter, about $20. (I wish the company would find it profitable to offer a left-handed version of the Sidewinder.) 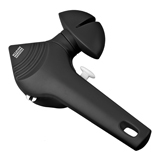 Go to FactoryDirect2You, and then search on: “kuhn rikon auto sidewinder safety lidlifter”. Available from ChefsCatalog.com. (By the way, be sure to check out verified coupons from ChefsCatalog.com for these and other kitchen indispensables.) See the Auto Safety Lidlifter, about $18. 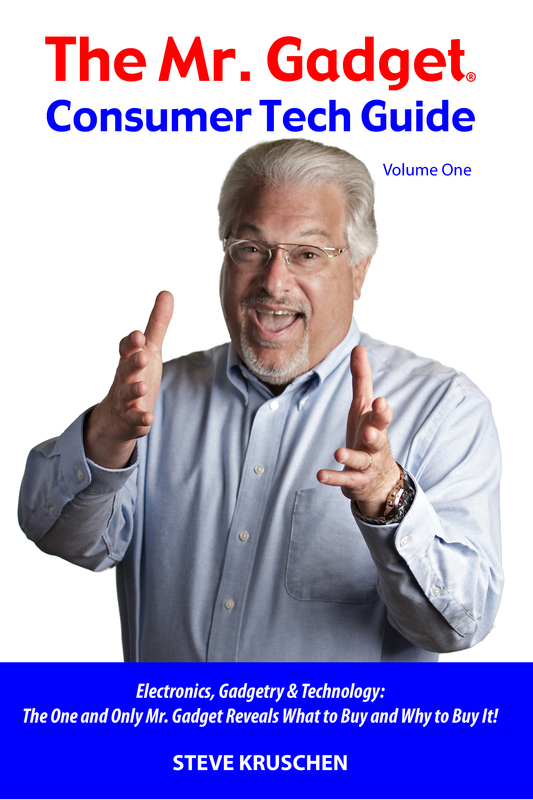 Buy from Amazon. Both may be difficult to find locally, if that is your preference, but worth the effort. Please don’t forget to email me about YOUR favorites, or about mine. Message me through Twitter @mrgadget or Facebook.